Motherwell lost their fourth consecutive match on Saturday when they crashed to a 3-1 Scottish Premiership defeat at Kilmarnock, writes Craig Goldthorp. The worrying run of form for the Steelmen means that the 10th placed Steelmen are now just one point above bottom club Dundee and facing a battle against relegation. Kilmarnock's Eamonn Brophy had two shots saved by Trevor Carson early on at Rugby Park but it was Motherwell who went ahead on 16 minutes when Curtis Main shot brilliantly low past Jamie MacDonald after Ryan Bowman's head flick. At first glance, Main appeared to be marginally offside when receiving the ball but the goal stood. After a slow opening, this game was livening up nicely and Motherwell wasted a great chance to double their lead on 23 minutes. Taylor-Sinclair went down under a Stephen O'Donnell challenge at the expense of a penalty, but Main's weak spot kick was comfortably saved by MacDonald. Kilmarnock came so close to levelling from a 26th minute from a Greg Stewart corner. 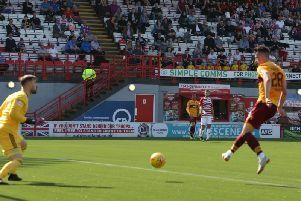 Kirk Broadfoot met the ball with a back post header but Motherwell defender Richard Tait cleared the ball off the line. The hosts were knocking the ball about nicely and they manufactured a 39th minute equaliser when Chris Burke rammed home the rebound at the back post after Jordan Jones' powerful initial left footed effort had been well parried by Carson. And the Ayrshire men went ahead two minutes before half-time when Stewart outmuscled Liam Donnelly and bore down on goal before firing low past Carson. The first chance of the second period saw Killie's Aaron Tshibola produce a rasping drive which Carson stooped to save, before Gael Bigirimana was yellow carded for a foul on the dangerous Stewart. Killie opened up a two-goal cushion on 58 minutes when Brophy slammed home from the penalty spot after Donnelly's foul on Stewart. Motherwell manager Stephen Robinson reacted to this body blow by making a double change with Danny Johnson and David Turnbull replacing Tait and Bigirimana. Main headed weakly at MacDonald and Aldred had a header from a Trunbull corner cleared off the Killie line. Main - Motherwell's best player - then produced a brilliant cross from the right which strike partner Bowman nodded weakly at MacDonald. The Steelmen's goal then led a charmed life when Stewart skinned Taylor-Sinclair on the right, cut in and sent in a crossball which Carl McHugh sent against his own post. And Killie went close again when Brophy cut in from the right and teed up O'Donnell whose left footer missed the target. Killie sub Bright Emobakhare then had an effort blocked by McHugh as the hosts continued to dominate. Tshbola was then put straight through on Carson but the keeper saved well, before O'Donnell set up Brophy to shoot off target. The hosts' dominance continued and Carson saved with his legs from Brophy after a brilliant attacking move. Motherwell sub Johnson blazed miles over the bar with his left foot from outside the box and later produced a low shot that was comfortable for MacDonald. Motherwell: Carson, Tait (Johnson 62), Taylor-Sinclair, McHugh, Aldred, Cadden, Main, Bowman, Grimshaw, Bigirimana (Turnbull 62), Donnelly (Sammon 83).